The web is filled with billions of images, helping to entertain and inform the world on a countless variety of subjects. However, much of that visual information is not accessible to those with visual impairments, or with slow internet speeds that prohibit the loading of images. Image captions, manually added by website authors using Alt-text HTML, is one way to make this content more accessible, so that a natural-language description for images that can be presented using text-to-speech systems. However, existing human-curated Alt-text HTML fields are added for only a very small fraction of web images. And while automatic image captioning can help solve this problem, accurate image captioning is a challenging task that requires advancing the state of the art of both computer vision and natural language processing. Image captioning can help millions with visual impairments by converting images captions to text. Image by Francis Vallance (Heritage Warrior), used under CC BY 2.0 license. Today we introduce Conceptual Captions, a new dataset consisting of ~3.3 million image/caption pairs that are created by automatically extracting and filtering image caption annotations from billions of web pages. Introduced in a paper presented at ACL 2018, Conceptual Captions represents an order of magnitude increase of captioned images over the human-curated MS-COCO dataset. As measured by human raters, the machine-curated Conceptual Captions has an accuracy of ~90%. Furthermore, because images in Conceptual Captions are pulled from across the web, it represents a wider variety of image-caption styles than previous datasets, allowing for better training of image captioning models. To track progress on image captioning, we are also announcing the Conceptual Captions Challenge for the machine learning community to train and evaluate their own image captioning models on the Conceptual Captions test bed. 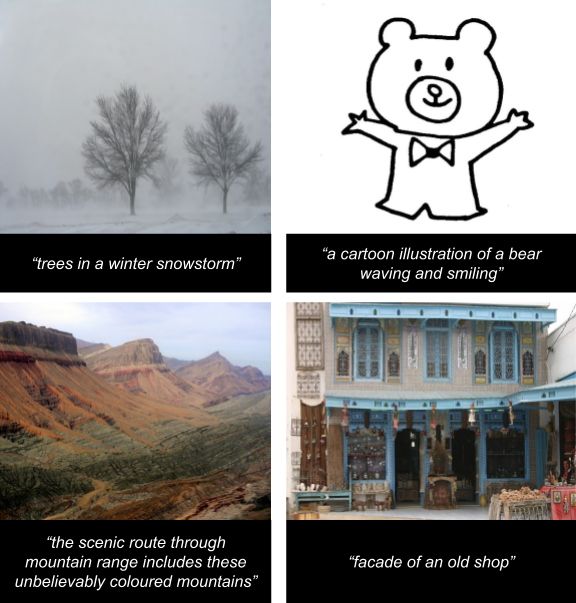 Illustration of images and captions in the Conceptual Captions dataset. 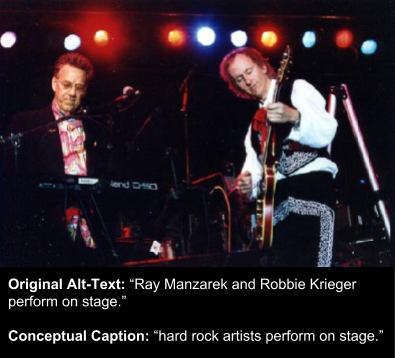 To generate the Conceptual Captions dataset, we start by sourcing images from the web that have Alt-text HTML attributes. We automatically screen these for certain properties to ensure image quality while also avoiding undesirable content such as adult themes. We then apply text-based filtering, removing captions with non-descriptive text (such as hashtags, poor grammar or added language that does not relate to the image); we also discard texts with high sentiment polarity or adult content (for more details on the filtering criteria, please see our paper). We use existing image classification models to make sure that, for any given image, there is overlap between its Alt-text (allowing for word variations) and the labels that the image classifier outputs for that image. While candidates passing the above filters tend to be good Alt-text image descriptions, a large majority use proper names (for people, venues, locations, organizations etc.). This is problematic because it is very difficult for an image captioning model to learn such fine-grained proper name inference from input image pixels, and also generate natural-language descriptions simultaneously1. To address the above problems we wrote software that automatically replaces proper names with words representing the same general notion, i.e., with their concept. In some cases, the proper names are removed to simplify the text. For example, we substitute people names (e.g., “Former Miss World Priyanka Chopra on the red carpet” becomes “actor on the red carpet”), remove locations names (“Crowd at a concert in Los Angeles” becomes “Crowd at a concert”), remove named modifiers (e.g., “Italian cuisine” becomes just “cuisine”) and correct newly formed noun phrases if needed (e.g., “artist and artist” becomes “artists”, see the example illustration below). Illustration of text modification. Image by Rockoleando used under CC BY 2.0 license. Finally, we cluster all resolved entities (e.g., “artist”, “dog”, “neighborhood”, etc.) and keep only the candidate types which have a count of over 100 mentions, a quantity sufficient to support representation learning for these entities. This retained around 16K entity concepts such as: “person”, “actor”, “artist”, “player” and “illustration”. Less frequent ones that we retained include “baguette”, “bridle”, “deadline”, “ministry” and “funnel”. In the end, it required roughly one billion (English) webpages containing over 5 billion candidate images to obtain a clean and learnable image caption dataset of over 3M samples (a rejection rate of 99.94%). Our control parameters were biased towards high precision, although these can be tuned to generate an order of magnitude more examples with lower precision. To test the usefulness of our dataset, we independently trained both RNN-based, and Transformer-based image captioning models implemented in Tensor2Tensor (T2T), using the MS-COCO dataset (using 120K images with 5 human annotated-captions per image) and the new Conceptual Captions dataset (using over 3.3M images with 1 caption per image). See our paper for more details on model architectures. These models were tested using images from Flickr30K dataset (which are out-of-domain for both MS-COCO and Conceptual Captions), and the resulting captions evaluated using 3 human raters per test case. The results are reported in the table below. From these results we conclude that models trained on Conceptual Captions generalized better than competing approaches irrespective of the architecture (i.e., RNN or Transformer). In addition, we found that Transformer models did better than RNN when trained on either dataset. The conclusion from these findings is that Conceptual Captions provides the ability to train image captioning models that perform better on a wide variety of images. It is our hope that this dataset will help the machine learning community advance the state of the art in image captioning models. Importantly, since no human annotators were involved in its creation, this dataset is highly scalable, potentially allowing the expansion of the dataset to enable automatic creation of Alt-text-HTML-like descriptions for an even wider variety of images. We encourage all those interested to partake in the Conceptual Captions Challenge, and we look forward to seeing what the community can do! For more details and the latest results please visit the challenge website. Thanks to Nan Ding, Sebastian Goodman and Bo Pang for training models with Conceptual Captions dataset, and to Amol Wankhede for driving the public release efforts for the dataset.